I guess so, copula - sometimes the site does not allow you to log in no matter what! You've to set up another account risking being called an 'imposter' since any one can use the previous poster's username and avatar in order to somehow give the impression s/he is indeed the real thing. Great username, Mona Lisa! The smile on the face of the Mona Lisa is so enigmatic that it disappears when it is looked at directly, says a US scientist. Professor Margaret Livingstone of Harvard University said the smile only became apparent when the viewer looked at other parts of the painting. The smile disappeared when it was looked at because of the way the human eye processes visual information. The eye uses two types of vision, foveal and peripheral. Foveal, or direct vision, is excellent at picking up detail but is less suited to picking up shadows. The elusive quality of the Mona Lisa's smile can be explained by the fact that her smile is almost entirely in low spatial frequencies, and so is seen best by your peripheral vision. The more a person stares fixedly ahead, the less useful is their peripheral vision. The best example of this effect was if someone was to stare at a letter on a page of print. Concentrating on one letter made it difficult to pick out other letters even a short distance away. The smile only became apparent if a viewer looked at her eyes or elsewhere on her face. The famous "quasi in rem" -- (Latin, "as if against a thing") is a legal term referring to a legal action based on property rights of a person absent from the jurisdiction. A quasi in rem action is commonly used when jurisdiction over the defendant is unobtainable due to his/her absence from the state. Any judgment will affect only the property seized, as in personam jurisdiction is unobtainable. Of note, in a quasi in rem case the court may lack personal jurisdiction over the defendant, but it has jurisdiction over the defendant's property. The property could be seized to obtain a claim against the defendant. A judgment based on quasi in rem jurisdiction generally affects rights to the property only between the persons involved and does not "bind the entire world" as does a judgment based on "jurisdiction in rem". The claim does not have to be related to the property seized, but the person must have minimum contacts with the forum state in order for jurisdiction to be proper. How can a court exercise personal jurisdiction over a case? 1) If the defendant lives in the state where the case is filed - this is in personam jurisdiction. 2) If the lawsuit is about a piece of tanglible property (a house, piece of land, etc.) located in the state where the case is filed - that's in rem jurisdiction. 3) If the person has sufficient assets in the state where the case is filed to pay any damages that may be awarded in the case - that's quasi in rem jurisdiction. In 1921, upon publishing "Group Psychology and the Analysis of the Ego," Freud was among the first to study the powerful influence that group leaders can have over group members. In his paper, Freud referred to the contagious and regressive nature of groups described by LeBon and McDougall, but he added the dimension of intrapsychic cathectic shifts that could occur in groups. Freud described the similarity of such groups as the Catholic Church and the army with the hypnotic situation. In all of these situations, there is a leader and one or more followers. The follower obeys the leader and gives up his own superego and ego ideal as he identifies with the leader's superego. Freud also compared the psychological changes occurring in group members to changes that occur to those who fall in love. In both cases, the ego can disregard the previous standards of the superego, because it gains a sufficient amount of narcissistic support and gratification of instinctual wishes elsewhere. If the individuals in a group are combined into a unity, there must be something to unite them, and this bond might be precisely the thing that is characteristic of a group. Le Bon thinks that the particular acquirements of individuals become obliterated in a group, and that in this way their distinctiveness vanishes. The racial unconscious emerges; what is heterogenous is submerged in what is homogeneous. The mental superstructure, the development of which in individuals shows such dissimilarities, is removed, and the unconscious foundations, which are similar in everyone, stand exposed to view. In a group, the individual is brought under conditions which allow him to throw off the repressions of his unconscious instinctual impulses. The apparently new characteristics which he then displays are in fact the manifestations of this unconscious. Le Bon believes that the individuals in a group display new characteristics which they have not previously possessed. Three factors are put forth as reasons for this: 1) the individual forming part of a group acquires a sentiment of invincible power which allows him to yield to instincts which, had he been alone, he would perforce have kept under restraint; 2) contagion; and 3) suggestibility. A group is impulsive, changeable, and irritable. It is led almost exclusively by the unconscious. A group is credulous and open to influence, it has no critical faculty, and the improbable does not exist for it. A group is subject to the magical power of words. Groups have never thirsted after truth. Shielded by the anonymity of a crowd, people abandon personal responsibility and surrender to the contagious emotions of the crowd. A crowd thus assumes a life of its own, stirring up emotions and driving people toward irrational, perhaps violent, action. However, it must be noted that if Le Bon often referred to the cliché of the irrational crowd, which was current in the 19th century and before (in particular in the fields of criminology, which tended to describe crowds as irrational and criminal groups), he considered himself the founder of "crowd psychology". Thus, he didn't consider crowds as totally irrational, but simply thought that ordinary individualist psychology wasn't relevant to this phenomenon. Le Bon was a pioneer in propaganda, which he considered a suitable and rational technique for managing groups, using for example communal reinforcement of beliefs, etc. Le Bon's 1895 "The Crowd: A Study of the Popular Mind" influenced many 20th century figures, including Adolf Hitler, whose "Mein Kampf" insisted on Le Bon's work. Le Bon made abundant use of the concept of "collective soul". Sigmund Freud would criticize this notion of collective unconscious, asserting that crowds do not have a soul of their own, nor do specific ethnic groups have a Volkgeist. Rather, individuals identify themselves to their leaders through their own "ideal ego" (that is, their subjective representation of their leader). The Freudian concept of an "ideal ego" later became the super-ego. Ultimately, leaders themselves identify themselves to an idea. Similar to extortion are markets for kidnappings (riskier, due to the physical act), and even untraceable markets for murders. For murder contracts, the usual risk is in setting up the hit--asking around is almost a guaranteed way of getting the FBI involved, and advertising in traceable ways is a similar invitation. This risk is largely removed when anonymous contact and payment methods are used. To ensure the job is completed, third party escrow services -- anonymous, of course, but with an established cyberspatial reputation -- hold the digital cash until completion. Much more has been written on this in various places. No doubt about it! In fact it exists the notion of a market, a theoretical prediction market where any party can place a bet (using anonymous electronic money, and pseudonymous remailers) on the date of death of a given individual, and collect a payoff if they "guess" the date accurately. This would incentivise assassination of individuals because the assassin, knowing when the action would take place, could profit by making an accurate bet on the date of the subject's death. Because the payoff is for knowing the date rather than performing the action of the assassin, it is substantially more difficult to assign criminal liability for the assassination. Timothy C. May published around October 1994 a primer on the issue. Jim Bell's later article "Assassination Politics" described the concept in detail, concluding that as well as being an unholy mix of encryption, anonymity, and digital cash, the concept could also be used to help minimize violent crime. Timothy C. May, Carl Johnson and Matthew Taylor later developed the protocols to implement the concept online to the point that the IRS, the FBI and the U.S. Secret Service investigated their motives for doing so. The US Secret Service circulated copies of 'Assassination Politics' and the relevant Wired articles in 2002. During investigations authorities pretended to be sympathizers in emails, posed as ISP representatives and sought Soviet style psychiatric repression in at least one case. In his much-publicized and hashed-over speech on race relations Monday, Barack Obama made a brief reference to the notorious O.J. Simpson murder trial, citing it as an example of the predilection to "tackle race only as spectacle." Less noticed was the elaboration he provided in an interview aired Monday night on ABC's "Nightline" on the question that once so divided many whites and blacks: did Simpson butcher his ex-wife, Nicole Brown Simpson, and her wrong-place, wrong-time friend, Ron Goldman? "You remember when, during the O.J. trial ... black and white culture just had these completely opposite reactions and nobody understood it. I'm somebody who was pretty clear that O.J. was guilty," Obama told "Nightline's" Terry Moran. He continued: "And I was ashamed for my own community to respond in that way, but I also understood what was taking place, which was that reaction had more to do with a sense that somehow the criminal justice system historically had been biased so profoundly that a defeat of that justice system was somehow a victory." For Obama, the jury remains out on whether he has defused the controversy that enveloped him as attention turned late last week to inflammatory comments uttered over the years by his pastor, Rev. Jeremiah Wright. An eccentric billionaire places before you a vial of toxin that, if you drink it, will make you painfully ill for a day, but will not threaten your life or have any lasting effects. The billionaire will pay you one million dollars tomorrow morning if, at midnight tonight, you intend to drink the toxin tomorrow afternoon. He emphasizes that you need not drink the toxin to receive the money; in fact, the money will already be in your bank account hours before the time for drinking it arrives, if you succeed. All you have to do is...intend at midnight tonight to drink the stuff tomorrow afternoon. You are perfectly free to change your mind after receiving the money and not drink the toxin. A possible interpretation: Can you intend to drink the toxin, if you know you don't have to? - An omniscient pay-off mechanism makes a person's decision known to him before he makes the decision, but it is also assumed that the person may change his decision afterwards, of free will. - Kavka's claim, that one cannot intend what one will not do, makes pay-off mechanism an example of reverse causation. - Pay-off for decision to drink the poison is ambiguous. - There are two decisions for one event with different pay-offs. Since the pain caused by the poison would be more than off-set by the money received, we can sketch the pay-off table as follows. According to Kavka: Whether you are paid or not, drinking the poison would leave you worse off. A rational person would know he would not drink the poison and thus could not intend to drink it. David Gauthier argues once a person intends drinking the poison one cannot entertain ideas of not drinking it. The rational outcome of your deliberation tomorrow morning is the action that will be part of your life going as well as possible, subject to the constraint that it be compatible with your commitment-in this case, compatible with the sincere intention that you form today to drink the toxin. And so the rational action is to drink the toxin. - There is reasonable grounds for that person to drink the toxin, since some reward may be obtained. Thus a reasonable person must both intend to drink the toxin by the first argument, yet if that person intends to drink the toxin then they are being irrational by the second argument. If, however, there was a man who has always tried to keep every promise that he has made in his life, then all he would have to do would be to promise the man that he would drink the toxin, knowing that he would have to drink it. Therefore he would, with complete confidence, decide to drink it, and not change his mind later. The smile on the face of the Mona Lisa is so enigmatic that it disappears when it is looked at directly, says a US scientist. Professor Margaret Livingstone of Harvard University said the smile only became apparent when the viewer looked at other parts of the painting. The smile disappeared when it was looked at because of the way the human eye processes visual information. The eye uses two types of vision, foveal and peripheral. Foveal, or direct vision, is excellent at picking up detail but is less suited to picking up shadows. The elusive quality of the Mona Lisa's smile can be explained by the fact that her smile is almost entirely in low spatial frequencies, and so is seen best by your peripheral vision. The more a person stares fixedly ahead, the less useful is their peripheral vision. The best example of this effect was if someone was to stare at a letter on a page of print. Concentrating on one letter made it difficult to pick out other letters even a short distance away. The smile only became apparent if a viewer looked at her eyes or elsewhere on her face. AMSTERDAM, Netherlands — The mysterious half-smile that has intrigued viewers of the Mona Lisa for centuries isn't really that difficult to interpret. She was smiling because she was happy — 83% happy, to be exact, according to scientists from the University of Amsterdam. In what they viewed as a fun demonstration of technology rather than a serious experiment, the researchers scanned a reproduction of Leonardo da Vinci's masterpiece and subjected it to cutting-edge "emotion recognition" software, developed in collaboration with the University of Illinois. The result showed the painting's famous subject was 83% happy, 9% disgusted, 6% fearful and 2% angry. She was less than 1% neutral, and 0% surprised. Leonardo began work on the painting in 1503, and it now hangs in the Louvre in Paris. 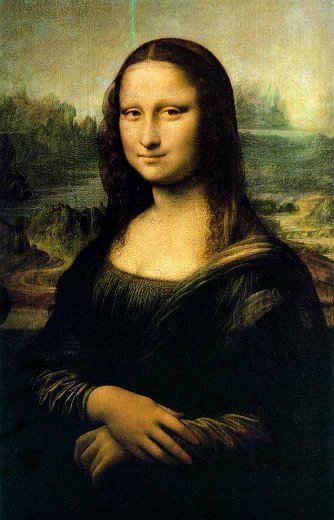 The work, also known as "La Gioconda," is believed to have portrayed the wife of Francesco del Giocondo. The title is a play on her husband's name, and also means "the jolly lady" in Italian. Harro Stokman, a professor at the University of Amsterdam involved in the experiment, said the researchers knew the results would be unscientific — the software isn't designed to register subtle emotions. So it couldn't detect the hint of sexual suggestion or disdain many have read into Mona Lisa's eyes. In addition, the technology is designed for use with modern digital films and images, and subjects first need to be scanned in a neutral emotionless state to accurately detect their current emotion. Lead researcher Nicu Sebe took the challenge as seriously as he could, using the faces of 10 women of Mediterranean ancestry to create a composite image of a neutral expression. He then compared that to the face in the painting, scoring it on the basis of six emotions: happiness, surprise, anger, disgust, fear and sadness. "Basically, it's like casting a spider web over the face to break it down into tiny segments," Stokman said. "Then you look for minute differences in the flare of the nostril or depth of the wrinkles around the eyes." Stokman said with a reading of 83%, it's clear happiness was the woman's main emotion. Biometrics experts not involved with the experiment said the results were interesting even if they aren't the last word on the Mona Lisa. "Facial recognition technology is advancing rapidly, but emotional recognition is really still in its infancy," said Larry Hornak, director of the Center for Identification Technology Research at West Virginia University. "It sounds like they did try to use a data set, even if it was small, and that's typical of work in an area like this that's relatively new. It's an interesting result," he said. Stokman said he knew the University of Amsterdam effort won't prove or disprove controversial theories about the painting. One is that it was actually a self-portrait of Leonardo himself as a woman. "But who knows, in 30, 40, 50 years, maybe they'll be able to tell what was on her mind," Stokman said. Hornak agreed the idea was entertaining. "It's always fun to apply technology to areas of public interest, and sometimes you can come up with results that are very illuminating," he said. Jim Wayman, a biometrics researcher at San Jose State University agreed. "It's hocus pocus, not serious science," Wayman said. "But it's good for a laugh, and it doesn't hurt anybody.